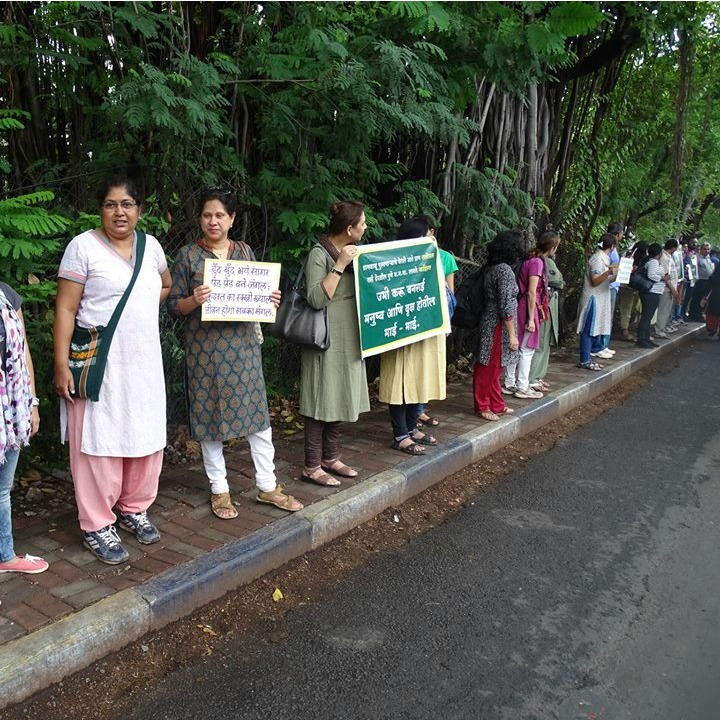 Pune|December 6, 2015: Hundreds of residents led by the ICS Colony, Bhosale Nagar mohalla committee took to the streets on Saturday protesting the proposed road widening by Pune Municipal Corporation (PMC) from Vaikunth Mehta National Institute of Co-operative Management (Vamnicom) to Spicer College, a project that would affect over 2,000 trees besides creating more traffic issues. Residents claim that the road widening project is being hurried by civic authorities even before the process of land acquisition has been completed in order to aid a private developer’s upcoming property. Over 2,000 signatures were collected by the protestors against the plan. Not only did residents of nearby areas join in the protest, but also those of mohalla committees from all over the city besides students of the institute. Suvarna Akhegaonkar, one of the members of the local mohalla committee, said that residents first raised their voice against the proposed road when the draft of the development plan was made public about two years ago. “No kind of public consultation or ecological impact assessment has been done for what appears to be a very hurried project. We had sent nearly 800 objections but haven’t received any reply from them. And now we hear that they are already trying to acquire the land and start the process which is why we have started signature campaigns, both physically and on the Internet, to save the trees,” she said. Another member, Subhash Bhishikar, said that the immediate trigger to the protest was the news that PMC has decided to start work on a 750-metre patch on a budget of Rs 2.51 crore for the stretch of road from Vamnicom to Joshi Gate of Savitribai Phule Pune University. “Not only would this lead to cutting of 2,000 trees and a part of the hillock (tekdi), thus threatening the flora and fauna, but it doesn’t solve the traffic problem either as it would create a bigger vehicular burden at University chowk. Had this project been in public interest, we wouldn’t have objected to it. But all the people here are up in arms as this is in vested interest,” said Ameya Jagtap, a Bhosale Nagar resident and also a member of the PMC’s tree authority. In fact even Vamnicom authorities are opposing the road widening plan and have even invited the wrath of PMC in the form of a legal notice for not allowing a survey of their premises. “Firstly, this is a central government institute and the PMC has not obtained any permission for road widening or even survey. We are opposing the proposal as it has serious consequences to the institute. Not only will it disturb the ecology, but also increase noise and air pollution. Vehicular traffic will pose a threat and nuisance to students. They want nearly 10 acres of our land and we will lose many buildings and hostels which we cannot allow. PMC has to consider: development is fine but at what cost?,” said Sanjeeb Patdoshi, director, Vamnicom. Despite repeated attempts, Rajendra Raut, superintending engineer of the road department, who is in charge of the project, wasn’t available for comment. Residents say that they now plan to collect signatures and put it before civic officials next week.